Residents in Northeast Florida and Southeast Georgia are offered all the benefits of an academic health center by combining our strengths with that of the UF Health Jacksonville. 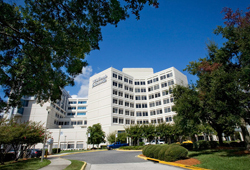 UF Health Jacksonville is a private, not-for-profit hospital affiliated with the University of Florida Health Science Center campuses in Jacksonville and Gainesville. The hospital is made up of more than 3,300 employees, all supporting the hospital's mission to heal, comfort and educate in an environment where exemplary medical care is complemented by outstanding service. As an academic health center, we're on the leading edge of the latest treatments and technologies. And our participation in clinical trials brings the latest research advances to the clinical setting, pioneering medical advances today to benefit patients tomorrow.